In Consumer Reports’ most recent tests of carbon monoxide alarms, three similar-looking off-brand alarms failed critical performance tests and have been rated Don’t Buy: Safety Risk. On average, an estimated 148 people in the United States die each year from accidental exposure to carbon monoxide produced by consumer products such as gas furnaces and ranges. Because carbon monoxide alarms are a critical line of defense against accidental poisoning, it’s imperative that they work properly. Consumer Reports is unaware of any death or injury linked to these three models. We test CO alarms for their sensitivity at different concentrations of carbon monoxide because even a relatively low concentration can be dangerous if the exposure is over a long enough period of time. Two of these alarms failed to sound when exposed to carbon monoxide at a concentration of 100 parts per million: the GoChange and the NetBoat. An alarm should sound within 40 to 165 minutes at that level of exposure. Additionally, the GoChange alarm failed to sound when exposed to carbon monoxide concentrations of 400 parts per million—a level at which an alarm should sound within 4 to 15 minutes. The NetBoat model did sound an alarm at this higher concentration, but did so after an average of only 30 seconds, instead of the recommended 4 to 15 minutes, which poses a different risk. A third model, the Foho, sounded too quickly at both levels—averaging 15 minutes at the lower level of exposure and 1½ minutes at the higher level of exposure. All three models have been rated Don’t Buy: Safety Risk, and Consumer Reports has notified the Consumer Product Safety Commission (CPSC) of its findings, as well as Amazon and eBay. After we alerted eBay, the company told us that based on our report it had removed the GoChange listing and requested that the seller contact any buyers who may have purchased the alarm. The company also told us that it was unable to find any other listings for the GoChange alarm and said that consumers who believe they purchased one should request a refund directly from the seller. Alternatively, eBay has a money back guarantee. Amazon told CR that the models we tested had been removed from its website, as had similar-looking models we pointed out that did not list that they met important safety standards. Amazon’s official policy prohibits the sale of carbon monoxide alarms that haven’t been tested to the standard, and the company indicated it would work with consumers who may have purchased these alarms under the terms of its return policy. Consumers should be aware that while these products may no longer be available on Amazon and eBay, they may still be available on other sites. The label of an alarm tested by UL carries the lab’s logo (left). ETL, another lab, specifically references UL-2034. All three of the carbon monoxide alarms that failed CR’s tests appear similar on the outside, and lack a brand logo on the alarm itself and on the packaging. 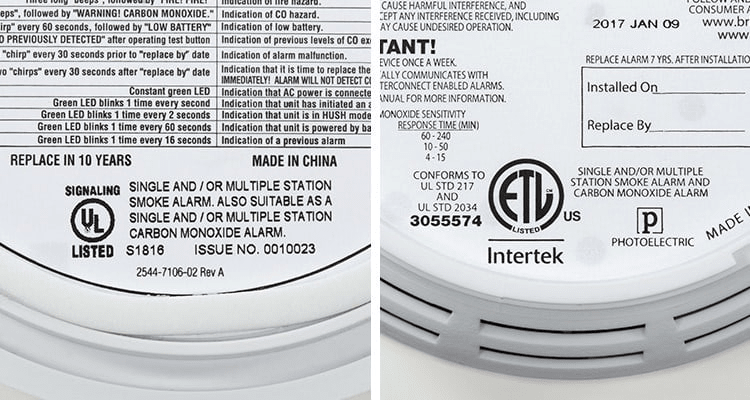 None carry a logo indicating that they’ve been tested to meet UL’s carbon monoxide alarm standard (UL-2034), which specifies a range of appropriate response times at various concentrations of CO in the air. A legitimate alarm can be certified by UL or labs other than UL to meet the UL-2034 standard. The certifying lab’s symbol will appear both on the packaging and on the alarm itself—typically on the side that mounts to the wall. UL told CR in an interview that it’s rare for a carbon monoxide alarm to possess a counterfeit UL symbol. “If your alarm does not carry certification that it has passed the UL standard’s requirements, we recommend that you replace it either with one that does or with one that has passed our tests,” say Deitrick. “All the tested models in Consumer Reports’ ratings that are assigned an overall score will reliably alert you to dangerous levels of CO, without triggering nuisance alarms at lower levels.” What distinguishes recommended models, explains Deitrick, is that they alert you earlier within the appropriate time window. CR’s top-rated standalone CO alarm is the First Alert CO615. First Alert also makes CR’s top-rated interconnected CO and smoke alarm, the OneLink SCO501CN, which syncs with all the other compatible alarms in your home. Interconnected alarms provide an extra level of protection: If CO is detected in the basement, the alarm in your second-floor bedroom will also sound, giving you a more immediate warning. In addition to owning functioning carbon monoxide alarms, it’s important that you place them correctly. Consumer Reports advises placing alarms on every level of your home, including your basement, and near (not inside) attached garages. More information on proper placement and tested models is available in our CO alarm buying guide.